“These companies are really preying on financially vulnerable consumers. In many cases they are offering services that could make their situations much worse. It is a really big problem,” he said. Steve Eckersley, head of enforcement at the ICO, said the issue had been elevated to a “high priority”. 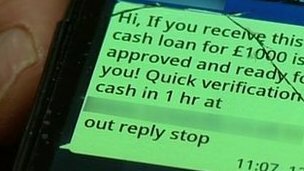 “Our recent survey reveals that half the population has received this type of spam texts, causing people alarm and distress. I am particularly worried about vulnerable people in the community, that they are being targeted,” he said. “We have been able to identify where these text messages have been sent from. And that is really important to us because we have been able to focus our activities around particular premises,” he said. After more than a year of constant texts, Sarah Stocks has finally got some peace – by changing her mobile number. “I begrudge having to do that, but I did not know what else to do. I feel really annoyed, angry at times, quite helpless,” she said.